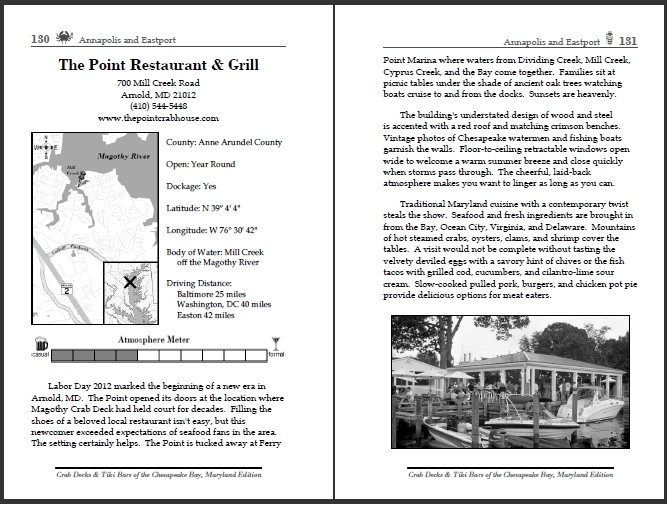 We’re pleased to announce the launch of Crab Decks & Tiki Bars of the Chesapeake Bay, Second Virginia Edition. The latest edition in the series of popular travel guides is designed for everyone with a thirst for adventure. • Use the book to discover hidden gems and eat just-caught seafood on every neck of the Bay from Norfolk’s bustling harbor to the scenic Eastern Shore, the historic port of Yorktown and carefree Colonial Beach. • Find something for every budget and mood, with waterfront destinations ranging from casual crab shacks to white linen fine dining. • With this book in hand, you can pick crabs at the water’s edge, sip rum drinks that make you feel like Polynesian royalty, and peel a mountain of shrimp in a converted oyster shucking house. For more about Crab Decks & Tiki Bars of the Chesapeake Bay, Maryland Edition, e-mail susan@crabdecksandtikibars.com or call Susan Wade at (202) 531-7135. It’s the most wonderful time of the year for Chesapeake oyster lovers. Autumn events celebrating the Bay’s bivalves are happening all around the region. You’ll find outdoor festivals where you can sample the local cornucopia of oyster brands, meet aqua farmers and watch shucking contests while enjoying music, crafts and family-fun activities. Chesapeake Oyster Lovers’ Handbook pulled together a list of 12 oyster festivals that bring the season’s harvest from the water to the shores.